The global Elevator modernization Market generated revenue of $9,781.4m in 2017 and is projected to reach $12,832.8m in 2023 growing at a CAGR of 4.63%. Europe holds the largest market share of 35% followed by America. By component Controllers holds the largest market share of $3439.1m in 2017 and is estimated to reach $4,686.1m growing at CAGR of 5.29%. 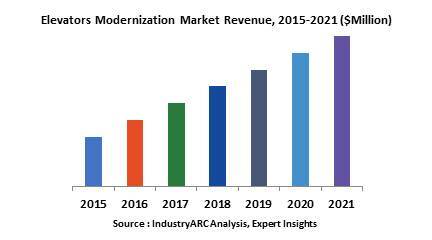 Increase in technological advancements and safety regulations are projected to drive the elevator modernization market. A vertical transportation for raising and lowering people or things to different levels in a modernized building is an elevator. There are two types of elevators traction and hydraulic. Elevator modernization include two different forms partial modernization and full modernization. What are the major applications for Elevator Modernization? Elevator modernization is about updating old components with the latest technologies for modern vertical transportation. It helps to move traffic efficiently while enhancing safety and comfort. Made easy for the end-user to travel vertically in their comfort zone. Modernization helps in increasing the life of existing elevators and offers cost effective solutions. Modernization includes complete replacement of existing control stations, cabin interiors, doors, signaling features, electric connections and others. ThyssenKrupp one of the leading player in the elevator industry introduced a TWIN elevator, this system has two cars arranged on top of each other that can operate independently in one hoist way. This system reduces energy consumption and can handle more traffic. TWIN saves space, saves energy and reduces passenger travel time. Another innovation named HoloLens in the elevator industry. This is the virtual reality headset changing the way mechanics do elevator repairs. These devices help mechanics identify a problem without climbing tens of floors. Once the mechanic put on the glasses, he can use hand motions to go close and explore the individual parts and individual engines. The view can also be widened, allowing the mechanic to do a virtual walk through looking for places where repairs or replacement are needed. The new direction in elevator technology which uses light weight carbon materials for cabins and doors will reduce the weight of elevators by 50%. Growing green building market facilitating the installation of energy efficient elevators which uses less energy and are more compact and efficient helps in boosting the market growth. Lift manufacturers are manufacturing elevators with high speeds of 4,000ft per minute. Manufacturers including Hitachi, Toshiba and Mitsubishi have been forced to make technological strides, using new motors and high-tech air pressure systems that allow them to transport people faster and higher than ever before in order to keep pace with the bigger buildings. Who are the Major Players in Elevator modernization market? The companies referred in the market research report includes KONE, Invetigo, Otis, Schindler, Mitsubishi, Thyssenkrup.